Water has been showing up in all sorts of unexpected places in our solar system, such as the Moon, Mercury and Saturn's moon Ganymede. Add one more place to the list: Asteroid 16 Psyche. This metal-rich asteroid may have traces of water molecules on its surface that shouldn't be there, researchers say. "The detection of a 3 micron hydration absorption band on Psyche suggests that this asteroid may not be metallic core, or it could be a metallic core that has been impacted by carbonaceous material over the past 4.5 Gyr," the team said in their paper. While previous observations of Psyche had shown no evidence for water on its surface, new observations with the NASA Infrared Telescope Facility found evidence for volatiles such as water or hydroxyl on the asteroid's surface. Hydroxyl is a free radical consisting of one hydrogen atom bound to one oxygen atom. "We did not expect a metallic asteroid like Psyche to be covered by water and/or hydroxyl," said Vishnu Reddy, from the University of Arizona's Lunar and Planetary Laboratory, a co-author of the new paper about Psyche. 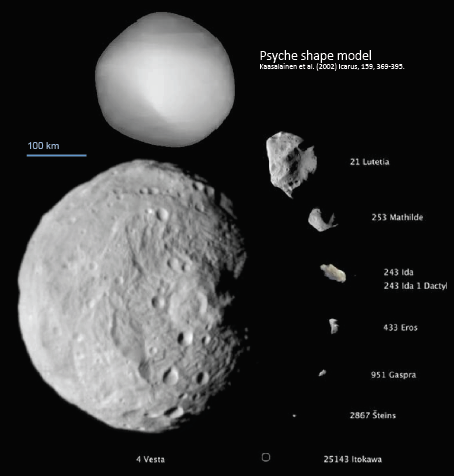 "Metal-rich asteroids like Psyche are thought to have formed under dry conditions without the presence of water or hydroxyl, so we were puzzled by our observations at first." For now, the source of the water on Psyche remains a mystery. But Redddy and his colleagues propose a few different explanations. One is, again, Psyche may not be as metallic as previously thought. Another option is that the water or hydroxyl could be the product of solar wind interacting with silicate minerals on Psyche's surface, such as what is occurring on the Moon. "Our discovery of carbon and water on an asteroid that isn't supposed to have those compounds supports the notion that these building blocks of life could have been delivered to our Earth early in the history of our solar system," said Reddy. If we're lucky, we won't have to wait too long to find out more about Psyche. A mission to Psyche is on the short list of mission proposals being considered by NASA, with a potential launch as early as 2020. 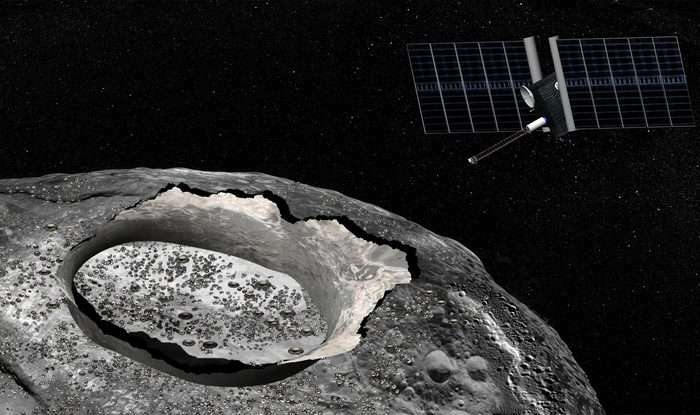 Reddy and team said an orbiting spacecraft could explore this unique asteroid and determine if whether there is water or hydroxyl on the surface. Could H2O be captured then broken by the hyper-polarity of the massive metallic chunk ? Another option, *the most likely explanation*, is that the water or hydroxyl could be the product of solar wind interacting with silicate minerals on Psyche's surface, such as what is occurring on the Moon. Water was NEVER unexpected on Jupiter's moon Ganymede. Astronomers early on recognized that water ice made up a large part of its make up.